"One of the most common mistakes people make when serving cheese is not letting it come to room temperature first, so that all the flavors can be fully realized. 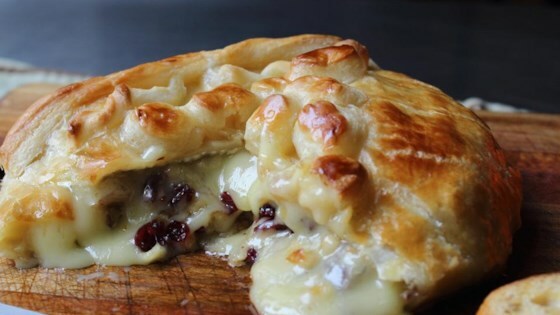 This beautiful baked stuffed brie takes that principle to the next level." Score the side of a wheel of brie all the way around with a sharp paring knife. Cut directly on the "equator" through the rind. Using a long piece of string or dental floss, wrap the string around the brie on the newly made cut. Loop one end of the string over the other (a half knot). Then pulling the ends of the string in opposite directions, cut the brie in half. Press the dried cranberries on one cut side of the brie, and the walnuts on the other. Quickly put the 2 sides back together with the cranberries on top of the walnuts. Press together and stuff back in any cranberries or walnuts that fell out. Roll out a thawed sheet of puff pastry on a floured surface to about 1/8-inch thickness. Place brie in center of pastry. Gently pull up edges to ensure you have enough dough to entirely wrap the brie. You can trim off the corners if there is too much dough. Brush the dough with the egg wash. Fold one edge of the dough over the brie and then the opposite side. Fold over the remaining edges and complexly encase the brie. You can trim off excess pieces of dough, if necessary. Flip the brie over so the seam is at the bottom; gently press in the sides to snug the dough against the brie. Brush the top and sides of the wrapped brie with egg wash. If you choose to decorate the brie with cut-out shapes of additional puff pastry, use very cold (almost still frozen) dough to ensure sharp lines. Lightly brush the decorative pieces with egg wash. Place the brie in the freezer for one hour (this is a crucial step; see note below). Preheat oven to 425 degrees F (220 degrees C). Line a rimmed baking sheet with parchment paper. This cheesy, fruity, and nutty appetizer will quickly become your favorite. Do not skip the freezing-for-one hour step. The crust needs to bake to a golden brown before the brie starts pouring out, so it must be partially frozen when it goes in the oven. If you happen to make it ahead of time, and put it in the oven frozen solid, then I'd lower the temp to 400, and give it an extra 10 minutes or so, or until the cheese is runny. Turned out beautiful but not a lot of flavor. Crowd pleaser! I did not do the string technique. I put the brie wheel in the freezer for about 20 minutes and was able to cut it in half with a knife with no problems. I used a refrigerated pie crust (because that it what I had) and it was amazing! Followed everything else exactly... RAVE reviews!